Not long ago I came across a plant that threw me for a loop. 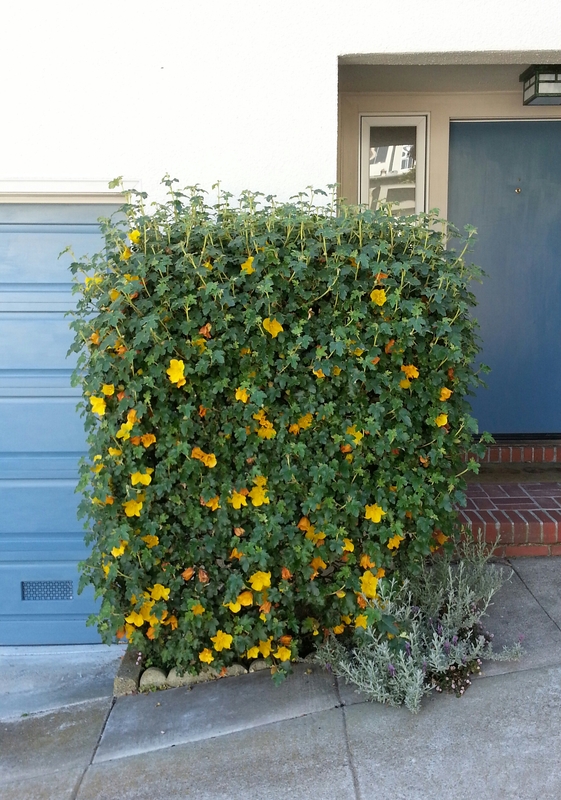 It was a California native plant, flannel bush (Fremontodendron californicum) that had been pruned into a topiary cube. At first, I was offended. Its natural form is that of a glorious large shrub, or even a small tree, sometimes with herringbone branching. It’s covered in brown fuzz on the trunk and stems (thus its name), and soft grey fuzz on the leaves, and many find the fuzz to be an irritant. It makes a great barrier plant for that reason. Large, waxy, golden flowers glisten with tasty nectar to attract pollinators. It’s a stunner. So who in their right mind would do this to such a plant?! The more I thought about it, the more I started to wrap my head around the idea of embracing it. 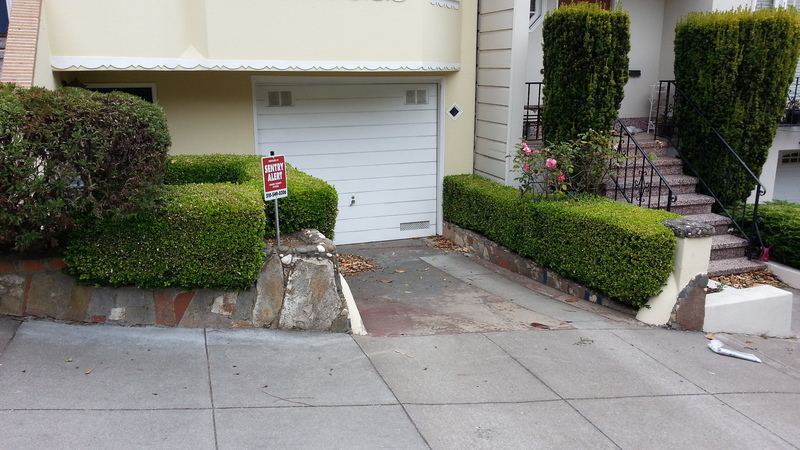 I mean, if you want a cube topiary, why stick with same-ole same-ole? 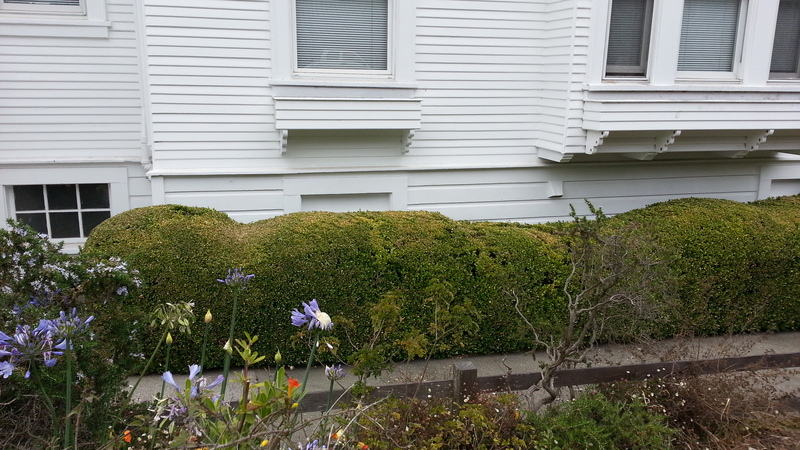 The reason I’ve generally disliked non-whimsical topiary specifically, is because of boxwood. Boxwood is the classic plant for hedges and topiary. 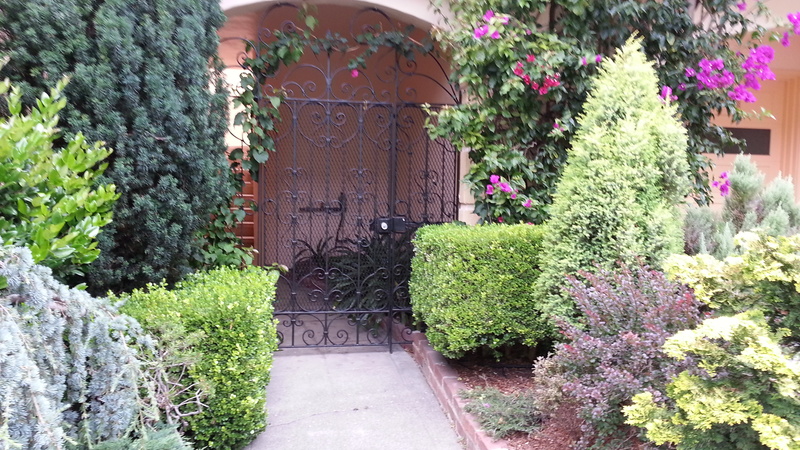 When I considered that, I realized it’s boxwood that I dislike, and not topiary in general. I love whimsical topiary, no matter what the plant, but appreciate atypical plant choices more. Boxwood’s merits are that it’s green, it’s deer-resistant, and it’s a plant. Aside from that, there’s nothing positive to say about it. It’s slow-growing and drought tolerant, to be sure, but so are thousands – thousands – of other plants. It doesn’t strain the brain to choose to use boxwood, and it takes even less thought to maintain it, so I get why it’s so common. But for me, once I’ve seen the same boring combination of plants half a dozen times, I’m already way over it. I want to be either excited or soothed by what I see. I want a garden to take me to another place. There are certainly valid uses for boxwood. In my favorite volunteer project, the Gardens of Alcatraz, for example, it’s used along the main roadway. In that situation, it’s not the type of plant anybody would have chosen for the spot today, but it is a re-creation of a historical planting: it was used in the Civil War era, when that bed was originally created, so it must be used today in the garden restoration projects. Boxwood’s purpose is just to “be there.” It’s a mass of green, and the eye doesn’t even register it. It can be used to frame in something that’s actually interesting to look at, but the plant itself is never worth a second glance. Mostly it’s just used as an extension of a building’s architecture, but almost any plant can be used to do that. Boxwood has been used in, literally, hundreds of millions of gardens for thousands of years, and it’s such a go-to that it’s no longer anything but a failure of imaginative design. Even the American Boxwood Society (yes, that exists), acknowledges it’s “Man’s oldest garden ornamental.” It’s the single most pedestrian plant in existence except for, perhaps, the American lawn, but at least that has appeal in the right application. It’s such a ubiquitous plant. You see boxwood in a garden and go, “Oh,” and look around for something else, even if you’re not conscious of doing so. It’s easy to care for, which is why every unimaginative architect in history has used it around public buildings. It’s a purely municipal plant, with a smell that many even liken to that of cat urine. Queen Anne actually had it banished from royal grounds for that reason. Creative landscape designers should be able to find a number of alternatives if they want their designs to stand out as anything but mundane, unless they’re only interested in “creating” something they’ve seen a thousand times before. You might say that, yes, I have an opinion on boxwood. 🙂 Some people like it, apparently. I’ve maintained boxwood for clients before, and the closest thing to excitement you get from pruning it is that you made it look exactly like you did last time, and didn’t mess it up. Whee. What fun. The most excitement it ever gave me was the rush I felt when celebrity-home tour buses would stop in front of me as I hand-plucked leaves (yes, really) off the globes in front of the mansion of romance novelist Danielle Steele. The boxwood itself had nothing to do with that excitement, I assure you. It lends itself to a formal garden, but it’s so automatic: you think “formal garden” and you default to boxwood, as if no other plant exists. You can’t use it in a formal setting and be able to claim you’re designing anything even remotely innovative, regardless of any other plants you’re using. 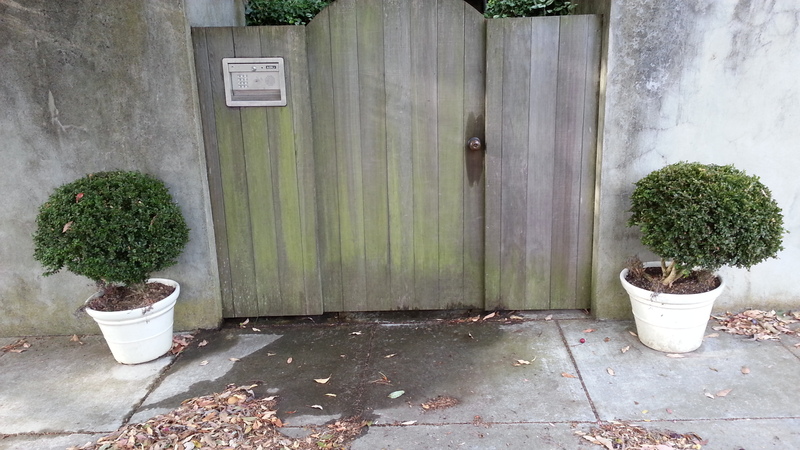 If there’s boxwood, it’s not innovative. To be innovative, you have to challenge yourself to think outside the repetitious boundaries of commonness. With so much to choose from in the plant kingdom, why limit yourself? That brings me back to this cubed flannel bush. These people certainly did not limit themselves. 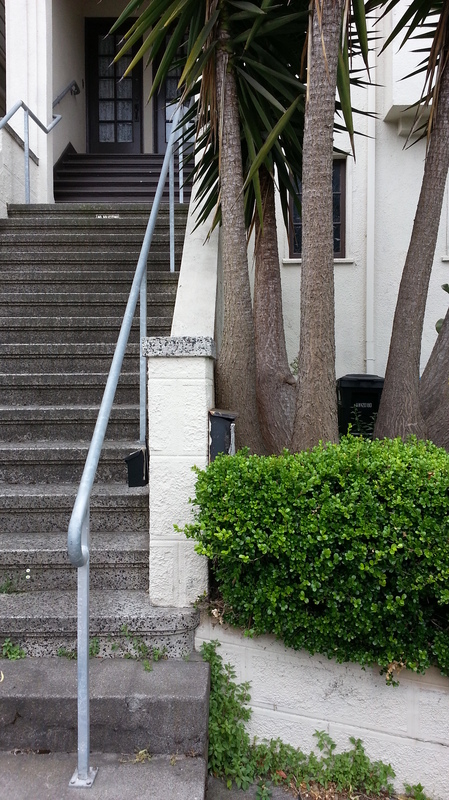 The more I walked past it on my way to a weekly gardening gig, the more it appealed to me. I was actually starting to appreciate non-whimsical topiary! For that matter, the unusual plant choice itself made the cube seem whimsical! I wondered what other plants might form interesting topiary, and the more I looked, the more I realized there are so many plants around me already doing the same thing as boxwood. There’s a huge variety of ways to use your imagination in a garden, without settling for the status-quo! Boxwood is generally used for the forms you can give it, but there are many plants that already grow in that form. If you’re wanting a rounded mound, some lavenders naturally grow that way. Or euphorbias. Or grasses. Or succulents. And if you want a truly tight “ball” of a form, you can do the same thing to most shrubs. I’ve seen spherical loropetalum (fringe flower), cotoneaster, cuphea, correa, and on and on. Masses of plants can create the same effect we so mindlessly turn to boxwood to provide us. You can create a hedge with other shrubs, or with a row of taller grasses or rushes. You can make a sculptural mounding of rosemary, if you want that uniform green mass, and you’ll also end up with purple flowers that benefit pollinators, not to mention having a culinary seasoning resource at your fingertips. I took a walk around town, and scoured the boZannical Tumblr, with an eye for interesting alternatives to tired old boxwood. Here’s a gallery of some of the interesting forms I came across. I’d love to hear what are your thoughts on boxwood, and what alternatives have you come across to using it? 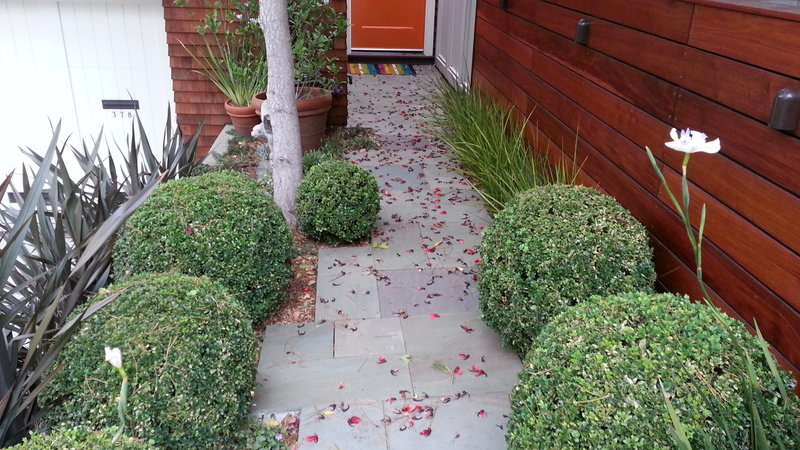 This pyracantha has been trimmed into a ball, like a boxwood, but offers COLOR! These bromeliads give a nice, rounded base to the podocarpus trees. I just love how this loropetalum pours over the wall. You can see how easily it could be shaped, if you wanted that. A gorgeous formal garden that will mature beautifully! Almost entirely CA natives, and not a single boxwood. Pittosporum varieties are also frequently hedged and shaped, but with more leaf variety than boxwood. Look how the light dances on the rippled leaves! Formality doesn’t require boxwood. Symmetry and form does the trick beautifully. … and a tea tree (Leptospermum) in the same shape! Together, they make quite a statement. Gorgeous formality with color and form variety. Imagine how dull a boxwood would be here. Wowzers! This euphorbia is simply amazing, no?! CA native ceanothus as a hedge! Benefit local insects, and still have the border of green. Hmm. There’s a globe boxwood or two in here. To me, this just reads that they’re trying to be clever by repeating the form with other plants. Without the boxwood, it would seem less contrived. On the RIGHT side are aloes. LOVE that! Seriously. Look at that yucca! A globe, without a boxwood in sight. Gorgeous borders of shrubs depend on a lack of boxwood. It’s a little lonely, but look at the color! You can still have that “ball” of plant, but use something that’s actually interesting to look at, like this leucadendron. Bamboo and horsetail make a great screen, sans boxwood. Even foxtail ferns can make a great hedge-like border. These agaves provide the same form as globes of boxwood, but with color and texture interest. 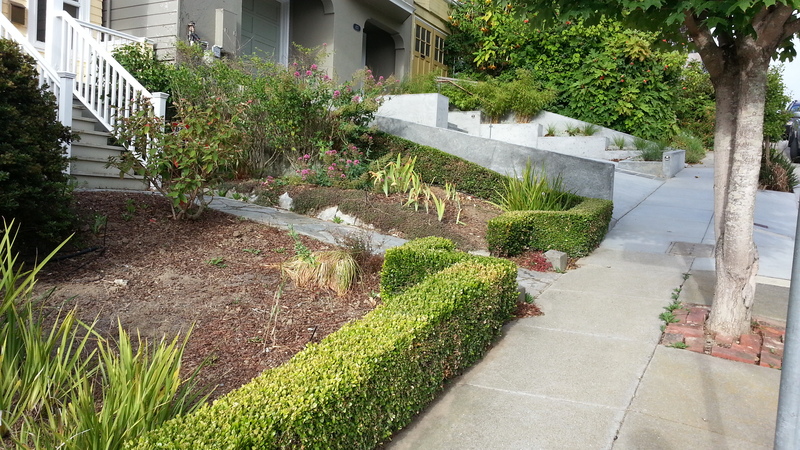 A “hedge” of low-growing CA native ceanothus, with aeonium for height. Would you want this, or a solid green block of boxwood? A mass of grasses forms a lovely focal point. A hedge of CA native rushes – Juncus effusus. These flowering plants can even be trimmed like a low hedge. Purple-flowering hebe, with cotoneaster at the base. Same shapes as you’d get with boxwood, only interesting. A stairway hedge of rockrose! Very shapable. Loropetalum as a trimmed border around a tree. This Petite Butterfly polygala on the left is the same form as a boxwood globe, naturally. Chamaecyparis is a commonly-used conifer that is a great sub for boxwood. Even this rosemary can be sheared into a sculptural hedge! Mmm. Such color and beauty! Loropetalum as a little globe! So easy to shape, and so colorful. The “Breath of Heaven” coleonema in the foreground can be shaped into a cube as it grows. This entry was posted in Alcatraz Gardens, Gardening, Horticulture, Oh, dear., Shoutouts and tagged botanical, california natives, climate, flora grubb gardens, fog, garden, gardening, gardens of alcatraz, horticultural, microclimate, natives, oh dear, parks, plants, san francisco, shoutouts, street gardens, trees, urban. Bookmark the permalink. Boxwood is back. Gardeners have rediscovered the charm and versatility of what enthusiasts call the “oldest ornamental” and are planting this handsome evergreen shrub in gardens of every conceivable design, from traditional to ultra modern. After a long decline, during which they came to be regarded as stodgy and frumpy, boxwood are once again the height of garden sophistication. Since the days of the Roman Empire, these slow-growing little bushes have been used to outline and embellish gardens with expertly clipped ribbons of deep green. Can’t call it “back” if it never went away. 🙂 I appreciate that there are many varying opinions and aesthetics out there. It would be a boring world if every garden were the same. I’ve enjoyed seeing that some people are keeping the classic forms used in boxwood, but without settling for using the only plant they’ve seen used in those forms. Pyracantha blooms during the spring from buds formed the previous season. Therefore, it’s best to wait until after blooming to prune this plant so you don’t remove the clusters of berries that provide fall color. Good pruning tip! Thanks for that input, Jamar. With an entirely natural topiary, your first step is to choose a plant. Yew is perhaps the best choice for most topiary projects. It holds up well in cold climates and it easily adapts to constant and even severe pruning. Juniper, boxwood, and arborvitae are also good possibilities. In a plot twist, I took a friend’s/mentor’s teaching to heart when she was talking about another plant that she had hated until she found the right spot for it: “If you dislike a plant, it’s because you haven’t found the right place for it.” I decided to challenge my opinion on boxwood, and planted – not one, but THREE – boxwoods in my own garden. One of these days I’m going to post the “fess up” post about it that I’ve been formulating since last year.